Erin's 2 Cents: Halloween has hit our house! Halloween has hit our house! I've had to make the rule for myself that I wait until about a month before a holiday to decorate. Otherwise, it gets a little out of control. It also gets my boys excited way too early, and then I have to repeatedly explain how long they still have to wait! Well, it's now October, so I can decorate for Halloween. 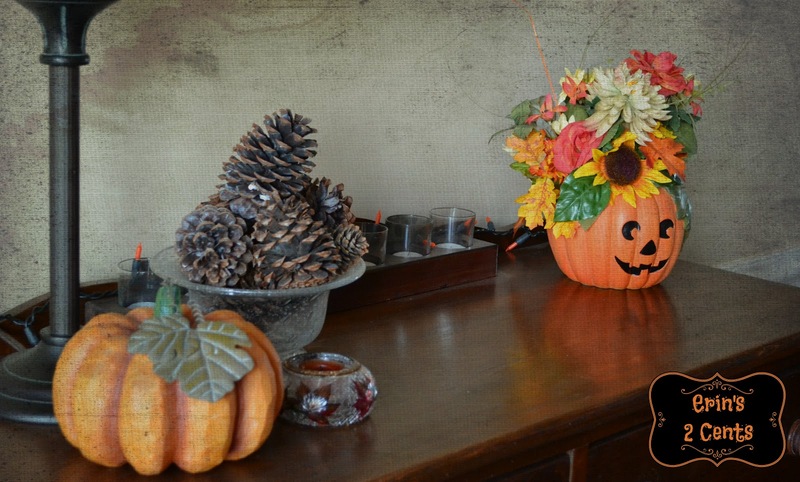 I already shared my fall decor, and I can easily add a few details to make them more appropriate for the upcoming holiday. It also makes it easy to transition into Thanksgiving afterwards. My mom stumbled upon Halloween lights for $1 each at Goodwill, so we now have those throughout the house. In the dining room, they are over the window and along the back of the jelly cupboard. I added a jack o'lantern to the jelly cupboard. 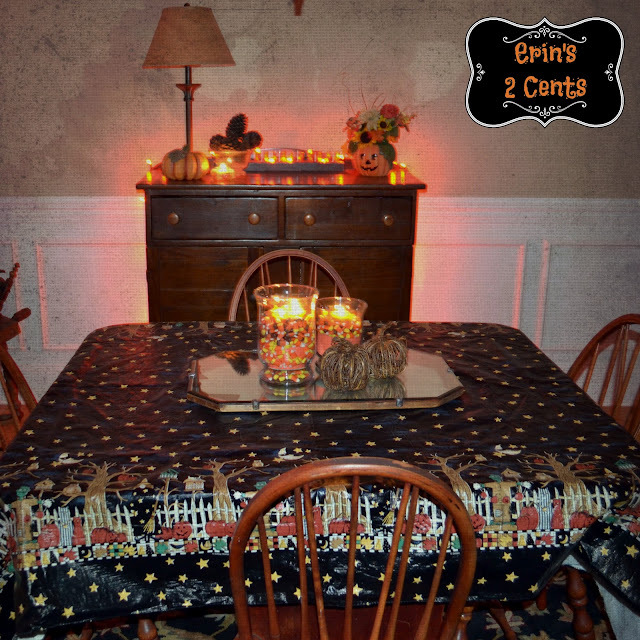 On the table, I spread a table cloth and traded out the wine corks in the hurricane glasses for candy corn. To use less candy corn, I bought the green flower molds to put in the bottom. 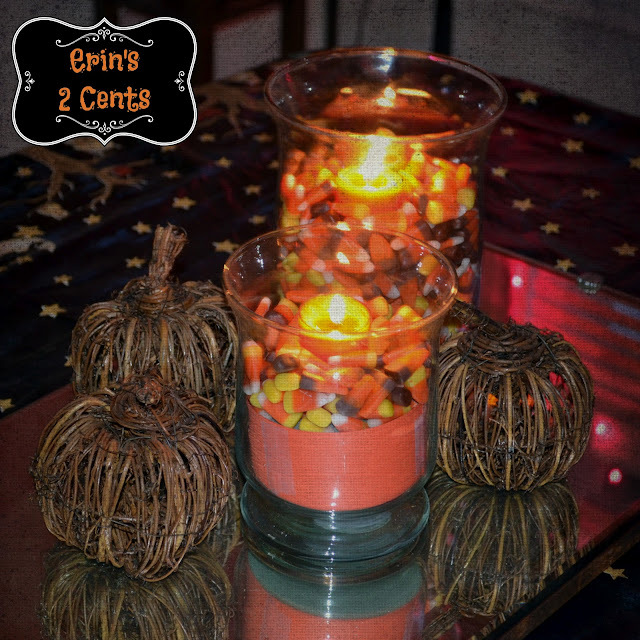 I was able to squeeze the candy corn around it in the big glass but not in the little one. To solve that, I cut construction paper the width of the block and taped it around. (I realized too late that the tape is showing in the picture. I have since turned the vase around to hide that!) The candy corn covers the green on top. Warning: If you have children like Brady, be prepared to find them planted on top of the table sneaking the candy at 6:30 in the morning! I also figured out how to avoid dusting the cobwebs off of our light fixtures... add more! My boys had a blast with this. I even got Ryan to help. The bag of webbing came from the Dollar Tree and had 4 spiders with it. 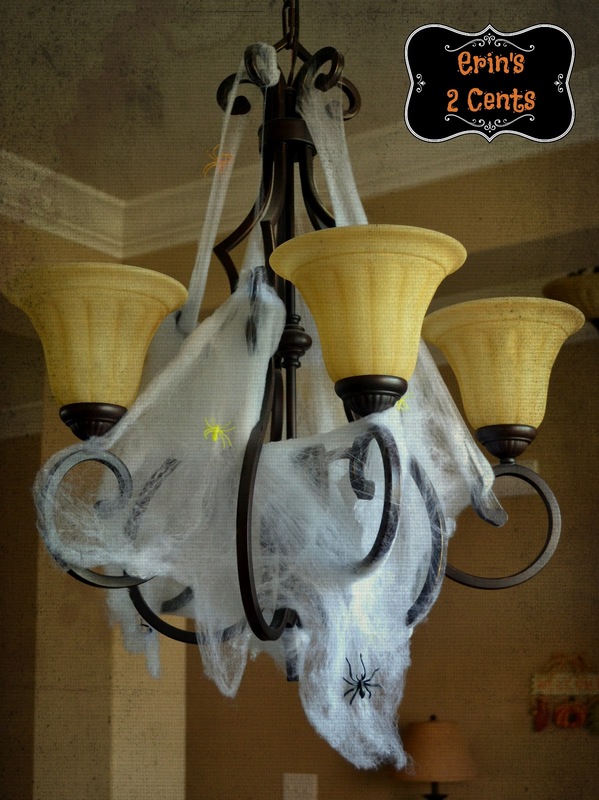 We also had some spider rings left from something else, so we put those in there as well. I was really impressed at the amount of webbing that came in the bag. We now have it all over the place. I'll share the other things we added in upcoming posts. Keep checking back for the spooky additions! Thanks to all of the wonderful link party hosts! Yeo, it has hit mine too and I love it! 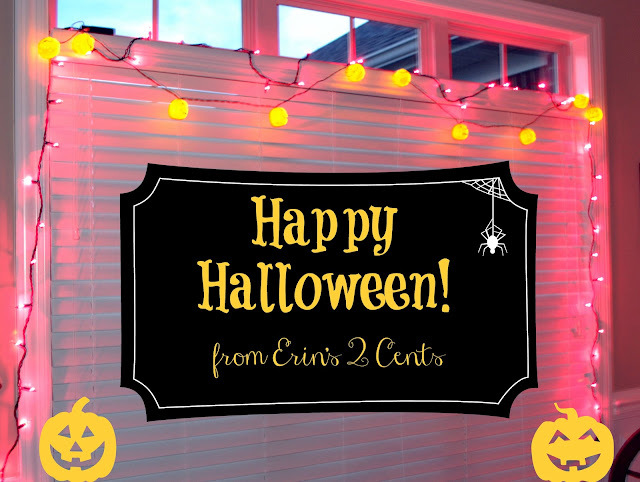 Thanks for sharing your festive Halloween house with us. Great looking dining room! I just found you through Debbiedoo's. I'm your newest follower and a newbie graduate. I hope you'll follow back at www.crazythriftycrafts.blogspot.com. Thanks for the inspiration! So cute! Thanks for linking up To Whimsy Wednesday! Found and followed you through Adorned from Above's link party! 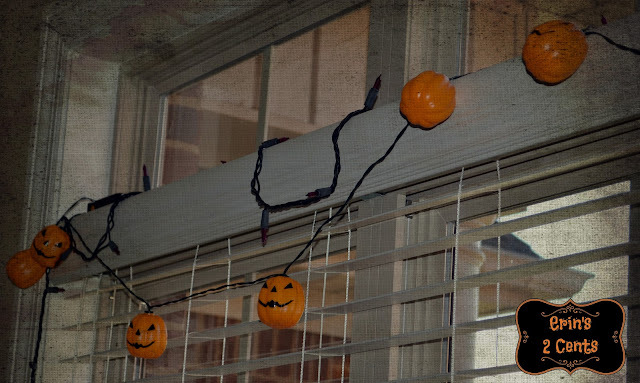 Love the spooky decorations. My favorite Halloween decorations always have lights! i need to adopt your rule as well... i get carried away too!